A story in the latest online edition of the Berkeley Daily Planet reminds us of the dangers of the stuff we use without thinking to rid ourselves of pests. It’s the worst kind of déjà vu. 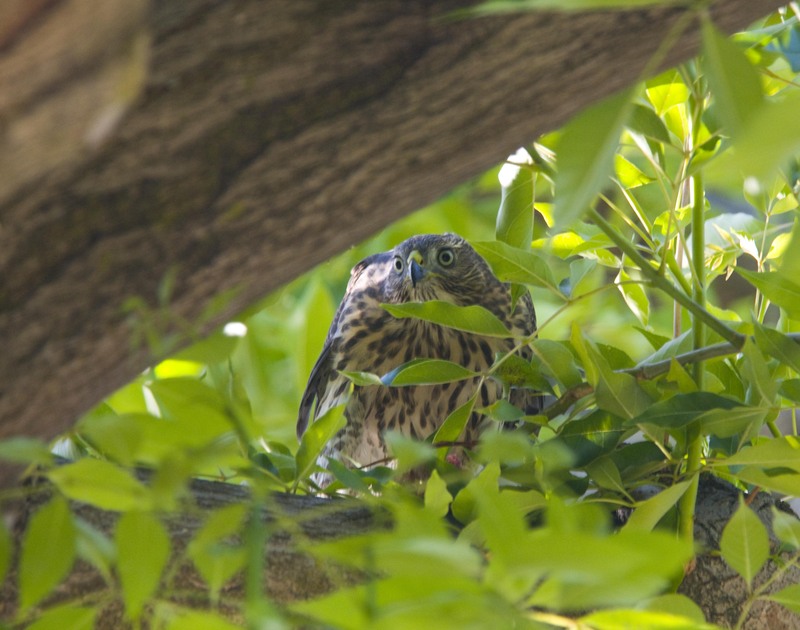 Last month a juvenile Cooper’s hawk was found dead in a pool of blood on a west Berkeley sidewalk, not far from where three other hawks succumbed four years ago. This year’s victim tested positive for the anticoagulant rodenticide brodifacoum, with a trace amount of another rodenticide, diphacinone. Brodifacoum was also implicated in at least two of the 2007 deaths. Some rodenticide users, homeowners and professionals alike, seem oblivious to the collateral damage the stuff can cause. Even if the bait is placed indoors, a poisoned rat or mouse can wander outside where it can be picked off or scavenged by a predator or pet. 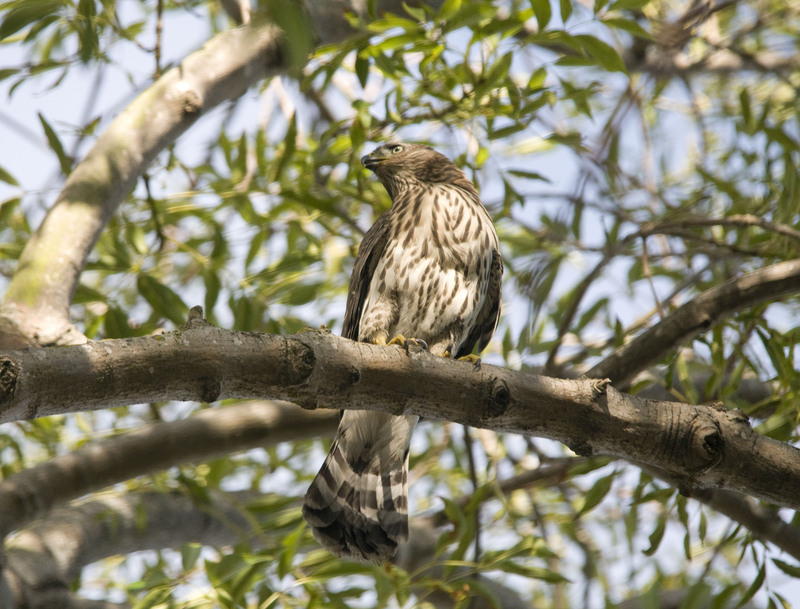 Although Cooper’s hawks are primarily bird-hunters, rats may be “starter” prey for younger individuals, easier to catch than pigeons or starlings. Hard-pressed parents may also bring rodents home for their hungry nestlings. Death by brodifacoum is particularly nasty. It kills by internal bleeding, which results in intense thirst. (The 2008 hawks were found in a backyard wading pool.) Like other “second-generation anticoagulants,” brodifacoum was introduced in the 1970s after rodents developed resistance to older products. The risk of secondary poisoning of non-target species like hawks is increased by the fact that the poison is not immediately fatal: a rat may keep coming back to the bait for several days as the brodifacoum in its body builds up to several times the lethal amount. According to the American Bird Conservancy (www.abcbirds.org/abcprograms/policy/toxins/pesticide), brodifacoum has killed hundreds of birds of prey: red-tailed and Cooper’s hawks, great horned owls, eastern screech-owls, golden eagles. Even mountain lions and endangered kit foxes have fallen victim. In New Zealand, populations of both raptors and insect-eating birds decreased following a brodifacoum-baiting program. The second chemical found in the hawks’ tissues, diphacinone, is one of the first-generation anticoagulants. Previous tests on mallard ducks and bobwhite quail had been used to claim that it was only minimally harmful to birds. However, a more recent US Geological Survey study found that small amounts of diphacinone were lethal to American kestrels. 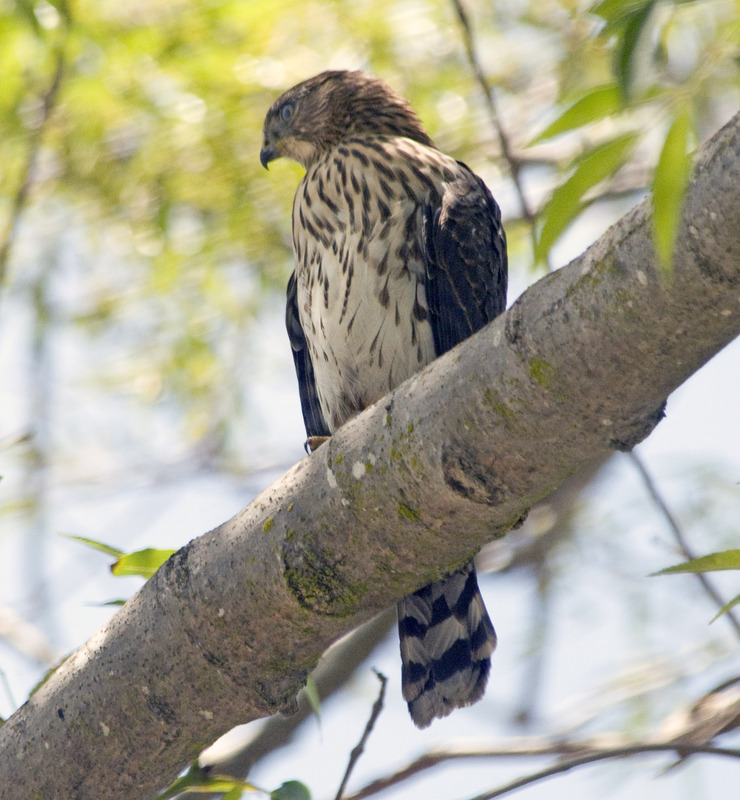 As little as 3 grams of liver from a poisoned rodent could kill one of these small falcons. 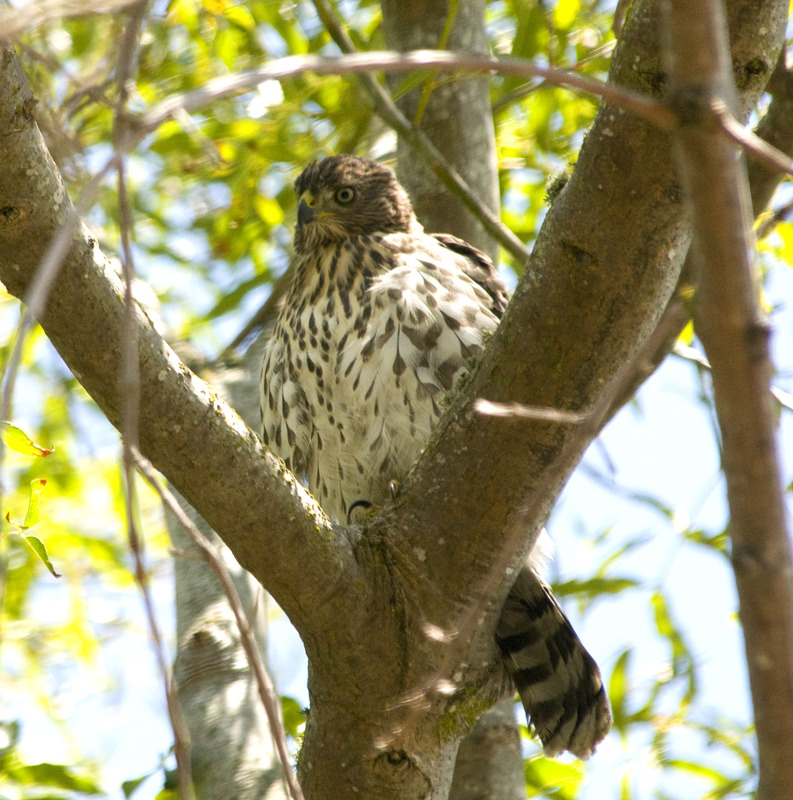 First, some Cooper’s Hawk factoids, thanks to Cornell University’s All About Birds page on the critter. Lots of interesting things thing, including recordings of the critter’s call. 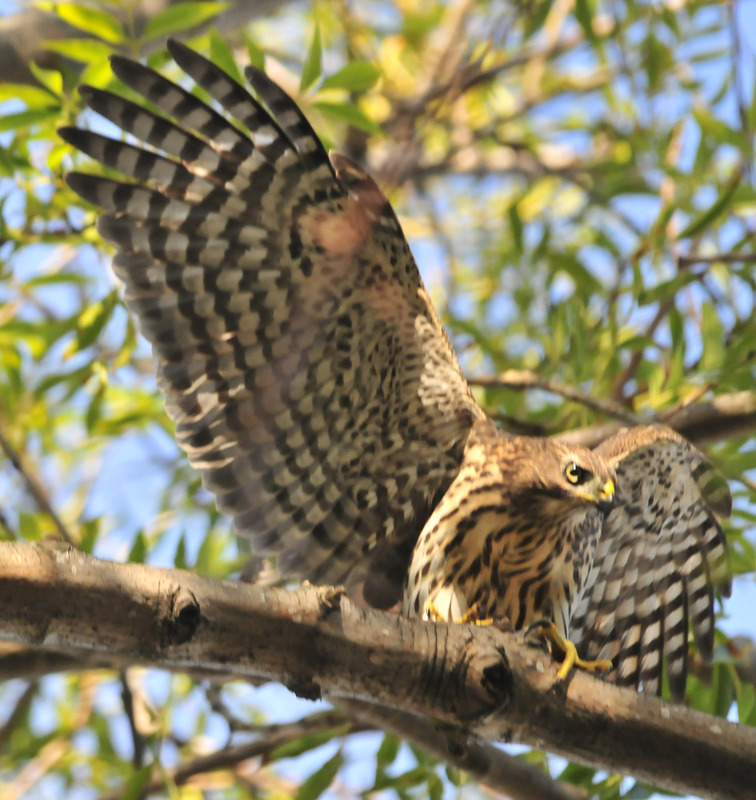 To the ornithologically minded, the hawk is known by its formal handle, Accipiter cooperii. 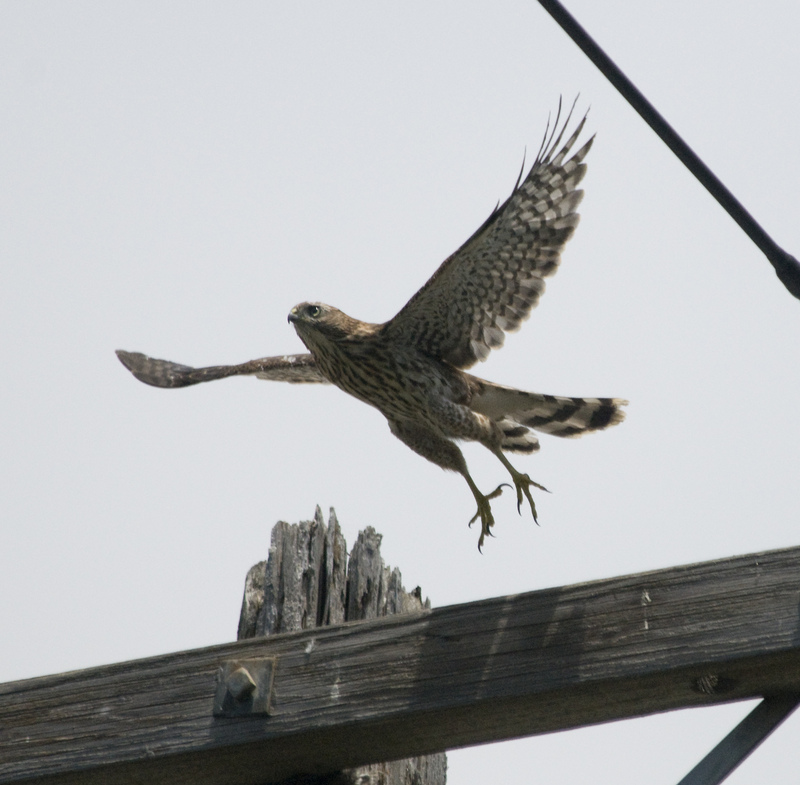 A Cooper’s Hawk captures a bird with its feet and kills it by repeated squeezing. Falcons tend to kill their prey by biting it, but Cooper’s Hawks hold their catch away from the body until it dies. They’ve even been known to drown their prey, holding a bird underwater until it stopped moving. 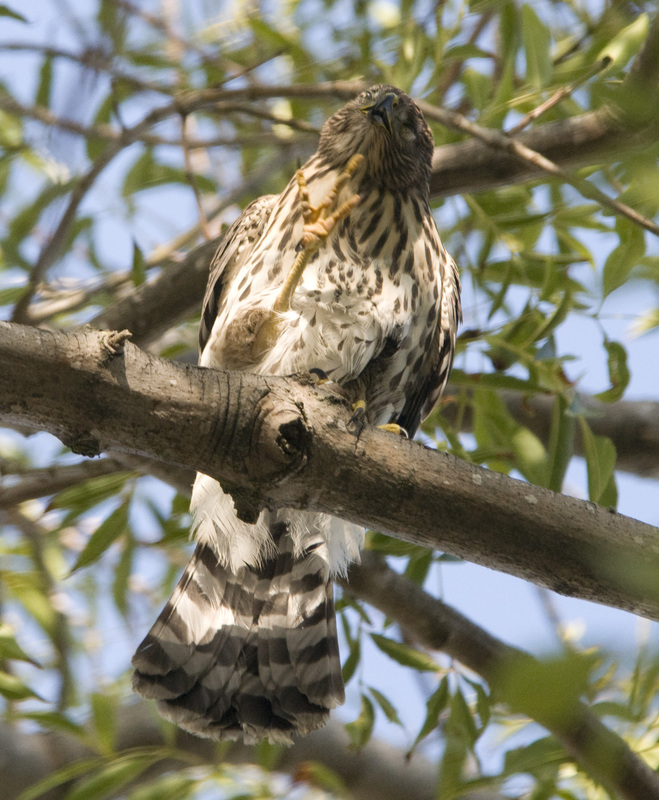 The oldest known Cooper’s Hawk was 20 years, 4 months old. 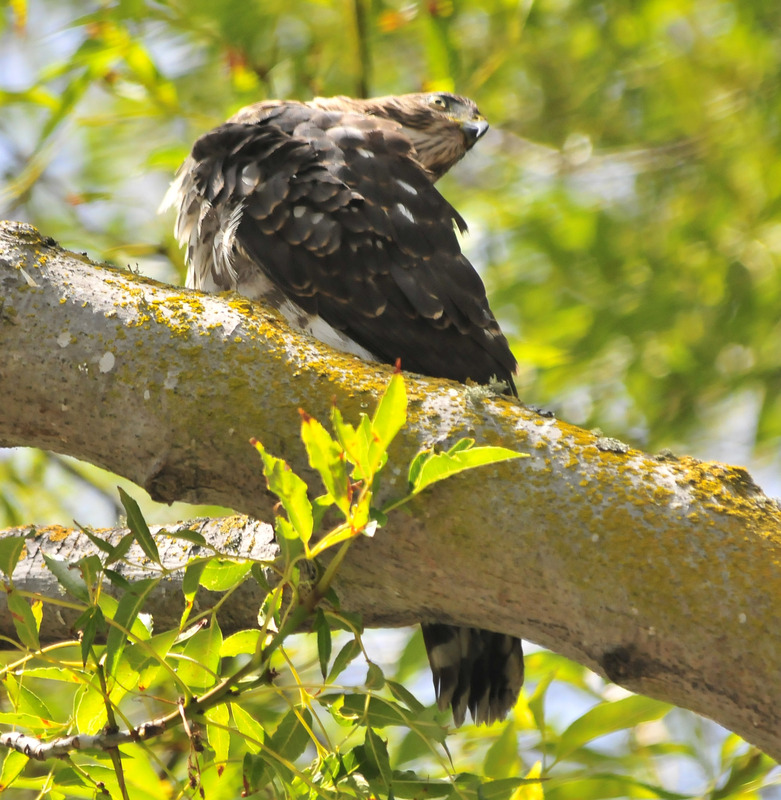 This afternoon, one of the hawks lit in a favorite perch two trees west of its nesting tree. The branches are thinner, making it easy to catch a glimpse of possible prey. This fellow was in the midst of grooming when a pigeon passed by, and the lens snapped at the instant he [?] turned to catch a glimpse of possible prey. But an ongoing itch proved the more compelling draw, so at least one Rock Dove [the true name of our pretend pigeons] was able to escape the raptor hug of death — at least for the moment. Seconds later, another avian arrived, this one a sibling. The bird perched higher up the tree in one of the few areas heavily shaded by the branches above. All three of the young birds were perched a couple of trees south of the nest, but two had flown by the time the camera was in range, leaving this critter as the sole candidate for today’s hawk post. Chin-scratching is quite a feat for a young Cooper’s Hawk, since it requires standing on one foot while keeping balance from atop a branch. A pair of the young were ought to catch the rays today. Here a sibling comes in for a landing, just a bit too fast for the camera to grab the sharpest possible image. Still. . . While a nestmate dines on birdie de jour, a sibling looks on hungrily moments after being driven off with by the well fed erstwhile comrade. At least esnl was. Shooting a bird flying with a long lens is tricky, but this worked out perfectly. One of the young taking wing. . .